Unistats and the information cult. Having been going on to anybody who would listen (and those who wouldn’t) about the Key Information Sets for the past year or so, I actually managed to forget today was the launch of the new unistats website. Once there was talk of the ‘information age’, but now we have an ‘information cult’. In the information cult, if there is enough information about things we can made good and right choices. Back in the 1980s there was an advert for a bank, which parodied their rivals—each time a customer asked a question the bank employee would reply, “Here is a leaflet about it”. The point about their bank was that they actually answered your questions in person. With the internet we have a gigantic worldwide “leaflet about it”, whatever “it” is. With the right information we can apparently make choices about which school to send our children to, what hospital to have our operation at, what car insurance to buy and which company is the cheapest for electricity this week. The launch of the new unistats has been receiving a lot of coverage, mostly negative on the Times Higher Website. 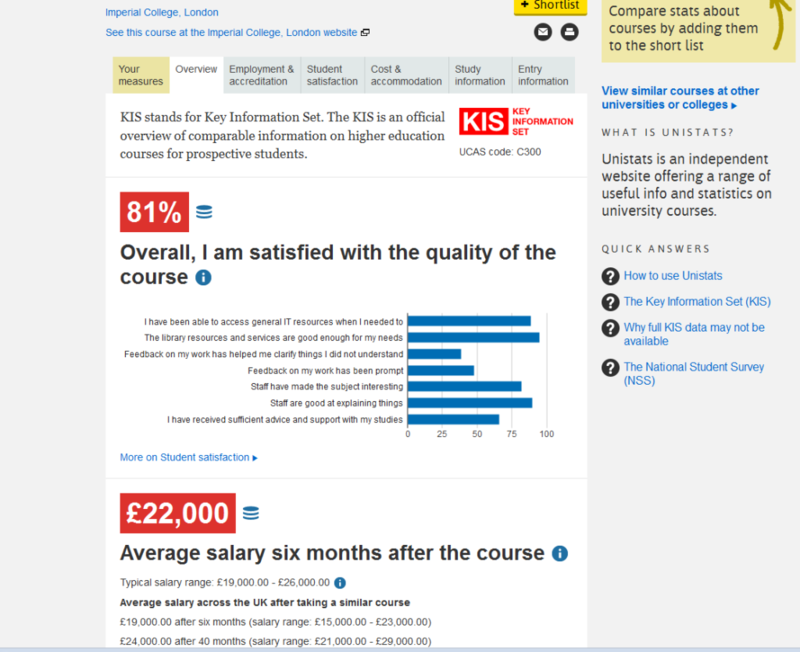 The KIS contains information on salary, % of assessment which is coursework and scores from the National Student Survey, among other things. As Roger Brown pointed out some months back, this is actually a moral issue. The idea that this information empowers potential students to make reasoned choices is very troubling. And like anything which is measured, universities (and any other organisations), as Adam Child is quoted as saying in the article, will focus on the what is measured rather than making improvements which really matter. And where there are numbers there are league tables. Some have suggested that choosing a university is becoming like buying car insurance a la Compare the Market. This is nonsense. You can change your car insurance company, you can move house, you can change your spouse and you can even your bank (allegedly we are more statistically more likely to change our spouse than our bank). The time and money expense of university means a wrong choice can be disastrous. Like a pawn move in chess it is made forever. In one of his books, Scott Adams, creator of the Dilbert comics talks about the confusopoly, an economic system sustained on the collective ability of service providers to confuse consumers with complex pricing structures, tariffs and performance measures. Perhaps that is what we are coming to here with universities. *Maringe, F. (2006). ‘University and Course Choice: Implications for Positioning, Recruitment and Marketing’. International Journal of Educational Management 20, 466–479. *Richardson, J .T. E. et al. (2007) The National Student Survey: development, findings and implications. Studies in Higher Education 32, 557-580. I have made a word version of this list available in humbox. 12 actions language lecturers are taking to engage with the National Student Survey. I have just been looking back at the NSS project I was involved with LLAS last year. The report concluded with 12 actions colleagues from nine institutions were planning to take. Not everyone will agree with all of them, I though I would post them here for interest. 1. Using the NSS questions on first and second year questionnaires. 2. Encouraging students to make more use of timetabled advice and guidance sessions. 3. Providing a more comprehensive introduction to the library resources. One colleague plans to recommend making library sessions obligatory. 4. Informing Level 2 students about previous actions taken in response to the NSS. 5. Discussing ways in which the NSS can feed into broader staff development, including courses for early career teaching staff. 6. Promoting more staff use of discussion boards in the institution‘s VLE as a means of providing feedback. 7. Encouraging tutors on skills modules to put more emphasis on transferable skills. 8. Developing a better understanding between staff and students of staff availability. 9. Communicating assessment criteria more clearly in order to relieve pressure on office hours. 10. Harmonising teaching and assessment for different languages. Where there are exceptions a case should be made to the students. 11. Fostering a 'personal tutoring' culture in the department. 12. Promoting awareness to students of the importance of the NSS. 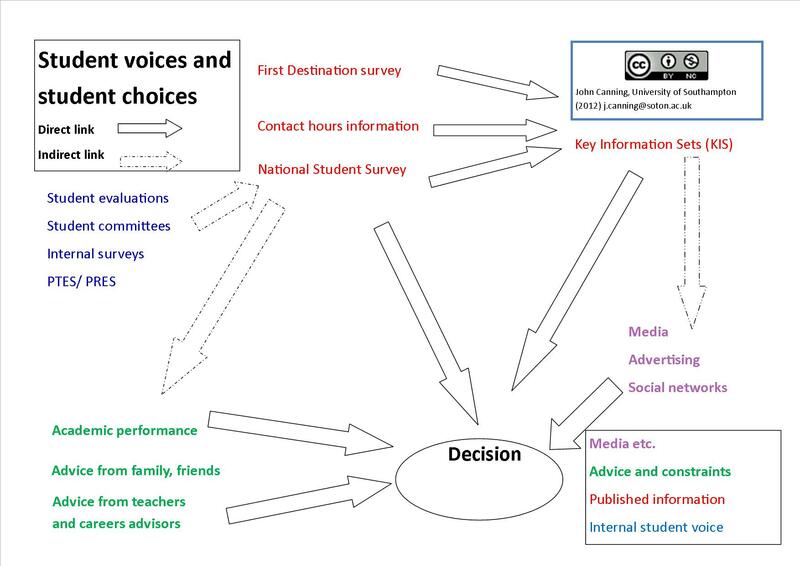 Diagram to conceptualise student information and choice. Spent some time today trying to conceptualise the way potential (UK) students make decisions about where and what to study relative to the information available and advice they receive. Comments welcome. Been doing this is preparation for next week’s workshop for heads of department. London Met: What message are we sending to the world and why is the Government doing it? The news last week that London Metropolitan University has lost its highly trusted status from the UK Borders Agency (UKBA) is not that troubling in itself. After all if there are irregularities in the way London Met has conducted its affairs then it ought to be investigated by the appropriate authorities. What makes me most angry about the situation is that the ruling affects existing students. These students (or their sponsors) have paid tens of thousands of pounds and spent one, two, three four years of their lives studying for a course that they are not allowed to finish. They have not broken any law in the UK, yet they stand to be deported or refused entry to the UK unless they can find another university to take them in the next three months. As anyone who works in higher education knows transfers between universities are academically and logistically difficult at the best of times. Few courses in UK higher education are ‘like for like’ meaning that even the most well-motivated transferees are likely to face some academic disadvantage. It damages the reputation of UK higher education as a whole. This is the message which is being sent: “Come to our university! We’ll let you in but can’t promise you will be allowed to finish”. We don’t know if the London Met situation is an isolated case or the first of many. Either way it damages the reputation of the whole sector. This will not just affect individual student decisions, but those of sponsoring businesses or governments overseas. If a company or other organisation is paying for an employee to acquire specific skills in the UK, they don’t want the UKBA deporting their employee for something which is entirely outside their control. The reputational damage has spread quickly. London City University has been implicated in a Chinese newspaper due to a linguistic misunderstanding or translation error (City and Metropolitan having very similar meanings). It sends the message more generally that the UK is not open for business. It sends the message that law-abiding individuals who spend their money in the UK and contribute socially and culturally are at risk of deportation at any time. It sends the wider message that individuals can be punished en masse for the actions of others. The Government wants to show its power over universities. It shows that the universities only operate with the consent of the Government. The Government wants to show that is “tough on immigration” and cracking down on universities, where thousands of non-EU people are in one place are a “quick win”. The Government has a specific vendetta against London Met. London Met has been in the news a lot in recent years for not very positive reasons. This may be a good way to get it closed down. Just a few thoughts from me. The students at London Met don’t deserve this and neither does the sector as a whole.